"Hello, Dolly/This is Louis, Dolly/You're looking swell, Dolly/ I can tell, Dolly..."
I laughed every time he followed a pause at the end of a line with that punchy catchphrase of "Dolly!" Dad then sang it again so he could swap "Dolly" for "Donny" and pretend he was singing about a little white South African boy rather than some swell-looking woman from America. Dad usually wore a short-sleeved checked shirt, cream shorts, long socks and shiny brown shoes that had been polished so brilliantly by Maggie, our black servant, they doubled as mirrors. You could smile at yourself when you looked down at dad's shoes. Meanwhile, up top, his short-back-and-sides were kept in place by a lick of Brylcream. Once, as a smiling black boy ran to us, I asked dad a question: Why were all black boys called John? "He's not called John," dad said. "It's just better than calling him 'boy.'" "Hello, master," the miner said. "You work hard, John?" dad asked. John nodded. "Yes, master…"
Natives always called my parents 'master' and 'madam'. "OK," dad said. The black boy slid into the backseat. "Morning, baasie [little master]," he said softly to me. Dad was a clever man. 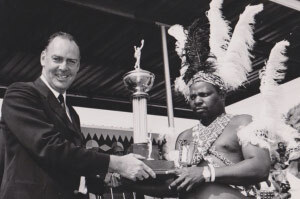 In 1961, just before I was born, he became the youngest-ever power station manager in South Africa. Dad worked for Eskom – the country's electricity supply commission. He always reminded us that Eskom gave us light and warmth. Eskom gave us the magic of electricity. There was no electricity in black South Africa, however, because the natives didn't need it. They were happy working for us. Dad was promoted to an ever bigger job at Eskom's headquarters in Johannesburg. 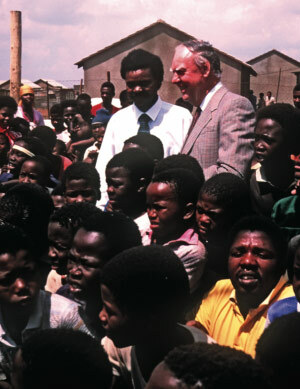 Eventually, he was responsible for the generation of all electricity in white South Africa. In my teenage years, life became serious. Conflict between me and my dad was defined by military conscription. My opposition to the South African army, and spending two years in defence of apartheid followed by nine three-month camps, escalated. 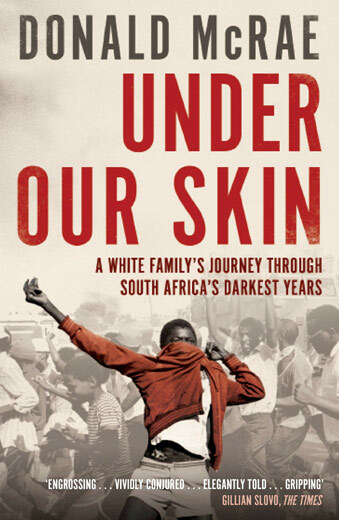 When I was fifteen, in 1976, we were rocked by the Soweto school riots. Hundreds of people were killed, with thousands more wounded, during clashes between black students and white soldiers. It became impossible to ignore apartheid's brutality. Inbetween chasing girls and getting hopelessly drunk, I berated my parents for forcing our servants to drink out of tin mugs and live in the backyard. Dad didn't tell me and my sister but, at work, he became a revolutionary. In the wake of the riots, he set about changing Eskom. He forced through radical measures which allowed black manual workers to sidestep their missing educational qualifications and train as power station technicians. My father still insisted that I do my military service. "I'm not going," I said, even as dad made sure I filled out my conscription form accurately. "You've got no choice," dad said firmly. I mistook my parents' insistence as evidence of their reactionary beliefs. But my alternatives – imprisonment, going on the run or leaving the country forever – were too painful for them to consider. It took the imprisonment and death of Neil Aggett in February 1982 to make us truly understand the darkness into which South Africa had sunk. I remember my mother crying, her bags of supermarket shopping strewn around the kitchen floor, when she heard the news. Her head sank down onto my chest and I could just make out her words: "I couldn't bear it," she said, "if that happened to you…"
In 1983, when I was still twenty-one, I decided to work in Soweto as an English teacher. It was one way of staying out of the army a little longer as I also extended my university career with another part-time degree. I would be one of the few white faces among a million black people. There were six murders a day in Soweto, a killing every four hours. And so on my first morning I was suddenly terrified. Militant students would learn that I lived in a big white suburban house, with maids and a gardener, "the girls" and "the boy". Perhaps the children of Soweto would set me ablaze amid the fires used to warm and light their un-electrified houses. As I prepared to drive into Soweto, dad put out his hand and, switching to Zulu, a language neither of us spoke, said "Hamba Kachle" ['Go Well' or, here, 'Be Careful']. During my otherwise happy eighteen months in Soweto I became even more judgmental at home. I relished telling dad that on winter mornings, when much of the township had to rely on coal fires instead of electricity, Soweto belonged to a Dickensian world of hardship and smog. I held my father personally responsible for the injustice. Yet I felt stricken when, in August 1984, I flew away forever. It was the moment we had dreaded, the moment which my father, in a bitter argument, once said would define our failure as a family. The idea that I would pack up and leave the country seemed like a betrayal of my parents. But they loved me and, finally, they let me go because apartheid was so entrenched we thought we might never be free from it. I could not bear the thought of my parents taking me to the airport. My sister and her husband waited for me at the bottom of the driveway, in their blue VW Beetle. I held my mother, and then turned to my father. He pulled me towards him. Dad kissed me on the cheek, which was something he had not done since I was a small boy. "Hambe Kachle" (Go Well)," he said. Dad lifted his hand and my mother's face crumpled when I was driven away from them. Their figures blurred as my eyes filled with the meaning of my leaving.